After last week's Eggs Benedict, I thought I'd give Eggs Florentine a whirl. To me, Florentine either means chocolate almond biscuits with cherries and sultanas or something full of cheese and spinach. Back when I worked in Exmouth Market (not actually on a market stall) my favourite sandwich shop made a toasted Florentine ciabatta - containing a mix of cheddar, mayo, mushrooms and spinach. A recipe for thunder thighs if ever there was one. It was like a hug in a sandwich. And during a particularly rubbish time of my life, I had a lot of sandwich hugs! Would've looked more inviting with a runny yolk! 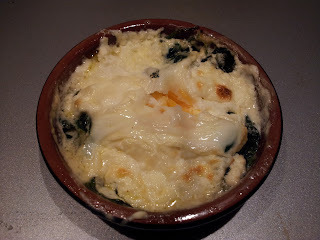 So reading Dame Mary's recipe for Eggs Florentine didn't surprise me that it had gallons of cheese sauce but I felt a bit guilty about such wanton abandon so I tried one from Gordon Ramsay's Fast Food instead. This just used creme fraiche and even though mine was half-fat, it was still a gloriously rich dish. Still have to get the hang of my new oven though as one minute the egg was barely cooked - the next the yolk had gone all solid. I'm sure a runny yolk would make it even better. Definitely a luxury breakfast or a light lunch with crusty bread. Heat oven to 400F. Melt butter in large pan over high heat. Add spinach and some seasoning and stir until wilted. Divide spinach among 4 buttered individual ceramic dishes and spread evenly, making a slight indentation in centre. Let cool slightly. Crack an egg into each indentation, then carefully spoon creme fraiche around. Season with sprinkle of salt, pepper and nutmeg. Bake in oven 10-12 min until egg whites are set, but yolks are still quite soft and runny. Serve immediately.